Convicted 07.07.1927 of selling out of hours. Convicted 09.08.1929 of selling out of hours. Fine £5 or 1 months detention. Convicted 15.03.1930 of selling out of hours. Benjamin Bransby is recorded as a `Coach Bender' at Three Tuns Yard in 1830. Daniel Osborn, John Burleigh and Thomas Elsegood caused a disturbance in the house, at three o'clock in the morning of Monday 20th November 1843. In court the following day it was heard that the landlord called N. W. Daynes, Number 19, to clear them out. They resisted and assaulted the constable. There were nine or ten other people in the house at the time. The three accused were all from St. Peter's per Mountergate. Elsegood was at the least fault and was fined 7s and 8s 6d costs or seven days hard labour. The other two received a fine of 10s and 10s 6d costs, or 14 days hard labour. Given in 1845 as the TUNS. Ground floor comprising Bar, Keeping Room and Small Cellar (Basement cellar not part of the estate). 1st floor sitting room and 2 bedrooms. 3 rooms on 2nd floor and Lean to room on 3rd floor. A Cottage to the rear connected to the house and used as a Wash house with room to let over. 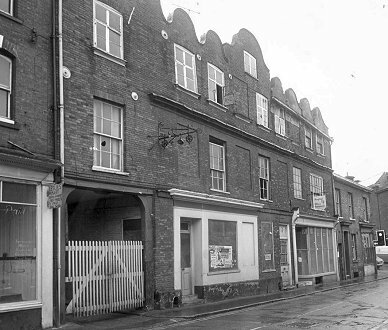 The Tuns Yard included Stables, Card Shed, Closets and Bin. The property being let to Messrs. Youngs, Crawshay and Youngs. 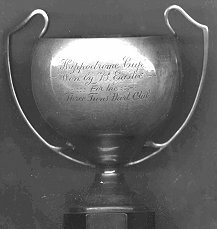 The Hippodrome Cup - ``Presented to B Eastoe for the Three Tuns Dart Club" This was presented to Bertie by the famous (at the time) piano player, Charlie Kunz. Thanks to Bill Eastoe for the photograph and information. On Tuesday 7th October 1941 the licence was transferred from the late William G. Tyrell to brewery representative Bertram Nichols. A music licence was also granted. Closed 1969 under Watney Mann (East Anglia) Ltd.
House No. 22 on 1845 Magistrates list.